Learn how art is made first hand by visiting local artists studios. In my, case I will have a studio full of looms ready for you to try your hand at weaving for the first time. Be certain to allow enough time to sit for a few minutes and learn to throw a shuttle. Its not very complicated, at least for the projects I have prepared for you. I will also be serving fine finger foods to stave off those cravings you get while roaming the countryside in search of great artists and their art. Of course, you will have the opportunity to purchase handwoven gifts, just in time for the gift giving season. I look forward to seeing you and having you weave with me. 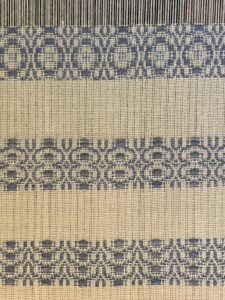 When I teach others, I am focused on the skills students want to acquire to meet their immediate weaving needs. For example, you have never woven before and you want to get started. I have a plan for that. I’ll bring you a loom to use that is completely set up, and we will sit down together, meet the loom and begin to weave. No big preamble to get started, just the basics, and the wonder of weaving for the first time. There is plenty of time to get into the grit of warping, designing and drafting later. For your first experience, I am looking to create a supportive environment in which you are ensured success. 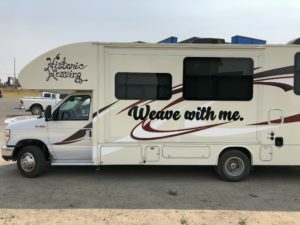 As a weaving teacher/coach, I can come to your home, or meet a public location that works for both of us. We predetermine the amount of time for the session, and perhaps the project you are most interested in completing. I am introducing my new 200 Thread Challenge Series of projects for the fall of 2018. This is a series of 4 warps, equally suitable for both new weavers and those with experience. 1. 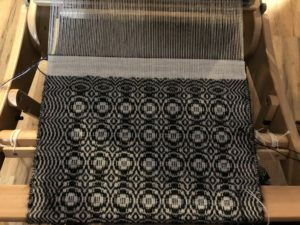 “50 Shades of Grey” Using only black and white warp and plain weave, can you create 50 different shades? What techniques will you use to control the outcome? 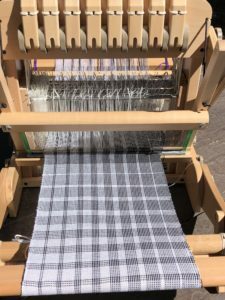 New weavers may want to explore the impact of unexpected color in a black and white warp. At the end of the session you will have a lovely wall hanging to remind you of your weaving session. 2. “What Moves You?” You are presented with a random color warp, how will you weave it? Are you most concerned about color, symmetry, structure or texture? You will be presented with a choice of weft yarns to complete your project. What you decide will help you to understand more about what is important in your weaving experience. 3. “The Inheritance” A warped loom arrives, there are no drafts, and no one to help you, it is just you and the loom? Can you discover how to weave the correct pattern? Do you want to? This exercise will help experienced weavers see how you will cope with the unknown. New weavers will be given hints to ensure success. 4. “Earn your Stripes” How will you create stripes on a single color warp? Will you use color or structure, or a combination of both. Do you like french linen, plaids or some other combination? 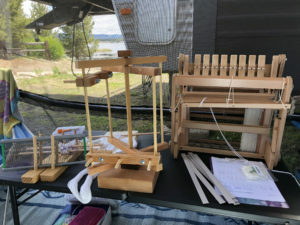 For small groups, I can bring all of four of my table/floor looms with the projects on them. When we meet, I will help you decide who gets to complete which challenge while we have a good time getting to know one another. If you are scheduling a two hour session, I will provide snacks and light beverages (water, tea, coffee) as part of the class fee. 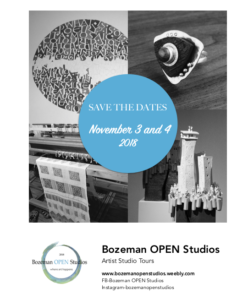 In the Bozeman area, the all inclusive cost is $100 per person weaving. 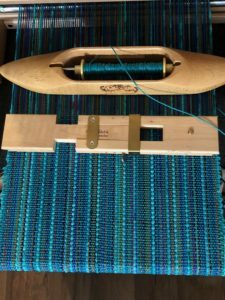 For that fee, I warp the loom, provide the weft materials, and facilitate a morning or afternoon of weaving fun. 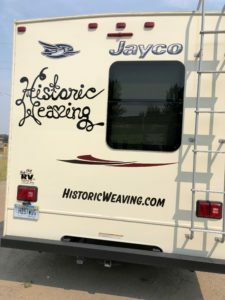 If you are located outside of the Bozeman/Belgrade area and want to schedule a 200 Thread Challenge session for you, your family, or your guild, please contact me (fill out the form below – in the comment please mention the 200 Thread Challenge) and we can discuss if a mileage fee will be needed to cover transportation costs to your location. For Rates and Options – see Rate Sheet.